Chromebooks should be dead. Netbooks—the Chromebook's shameful forefathers, made from the same plastic parts and budget internals—have shuffled into the sunset, and Chromebooks suffer from similar, shockingly severe limitations. Even calling the Chrome OS an "OS" is a bit too kind, as it's virtually crippled without an Internet connection. Yes, Chromebooks should be dead—but they're not. In fact, more manufacturers than ever are making low-cost laptops that run Chrome OS. Both HP and Lenovo jumped into the fray in recent weeks, joining Acer and Samsung on board the Google bandwagon. Why are so many companies suddenly rolling the dice on Chromebooks? Perhaps more importantly, can the widespread interest continue? One culprit behind the Chromebook surge is the softness of the Windows PC market. "There is no question that vendors are looking for any opportunity to keep sales up at a time when the traditional PC market is declining," said Carolina Milanesi, Gartner's research vice president for consumer technologies and markets, via email. "I also think that tablets have made vendors realize that users around the world are open to Microsoft alternatives." However, the sudden willingness of manufacturers to dabble in Google's operating system isn't due to the tepid public reaction to Windows 8 alone. HP and Lenovo may have been pushed into Google's arms by Microsoft itself. The prospect of keeping all of their eggs in Microsoft's basket suddenly seemed like a terrifying prospect to manufacturers, so they turned to Chromebooks. Microsoft's Surface killed Windows RT and created a newfound interest in Chromebooks. "[Manufacturers] became a lot more interested in Chromebooks when Microsoft did Surface," said Patrick Moorhead, founder and principal analyst at Moor Insights and Strategy, in a phone interview. "Based on those decisions they made months ago, we're seeing these [new] products come to market now." Given that background, the widespread dabbling in Chromebooks makes a lot of sense. Manufacturers have some considerable questions to answer about their "experiments"—as both Milanesi and Moorhead called the new wave of Google-powered laptops—before Chromebooks can be deemed a viable Band-Aid for sluggish Windows PC sales, however. All the practical reasoning in the world means nothing without an actual demand for Chromebooks. Chromebook sales have seen an upswing in the last six months. Acer's president recently said Chromebooks accounted for 5 to 10 percent of the company's U.S. shipments since November, while Chromebooks climbed up the Amazon sales charts during the holiday season. Just last Friday, Google bragged that more than 2,000 schools are using Chromebooks. 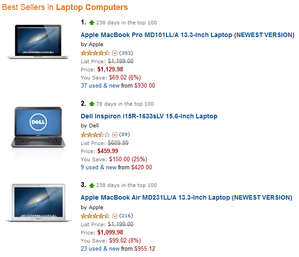 Chromebooks no longer top Amazon's best selling laptops list. Impressive stats! Unfortunately, they don't amount to much in the real world. Now that the time for low-cost computing gifts has passed, you can't find a single Chromebook in Amazon's top 20 best-selling laptops list. Acer's numbers also sound better than they really are. By Gartner's count, the company was the fourth-largest supplier of PCs in the U.S. during the holiday quarter, selling 1,377,824 units. Ten percent of that figure—Acer's high-end estimate—works out to 137,782 Chromebooks. That's good for just 0.7 percent of the 17,505,607 computers moved in the U.S. in the fourth quarter. In other words, Acer's Chromebooks only account for the slightest sliver of PC sales. That's a bad thing for manufacturers. "The business model is very similar to netbooks," says Moorhead. "Manufacturers aren't losing money [on Chromebooks]," a factor Moorhead attributes in part to the lack of licensing fees for the freely available Chrome OS, "but they have to ship a lot of them to make it worth their while." He doesn't see sales spiking until Google manages to "provide a more robust offline experience, to create a very low-cost PC replacement." That ideal is getting closer. 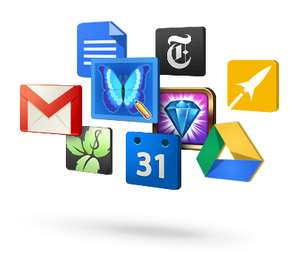 Google has introduced basic—sometimes very basic—offline functionality to Google Docs documents, Gmail, and Calendar. The recent wave of Chromebooks is more functional when offline than previous iterations, but you're still in for a world of frustration if you wander away from a working Wi-Fi connection. Can manufacturers make their Chromebooks stand out from the crowd? The basic appeal of Chromebooks—low cost and cloud connectivity—also poses problems for manufacturers. "These machines can run on liner specs on things like storage, as the usage model is all about the cloud," Milanesi notes, and it's true. Without the appeal of specification bumps, is it even possible for a manufacturer to create a Chromebook that competes on anything but price alone? "Industrial design and battery are life the two ways [manufacturers] can make their Chromebooks stand out and stay within their cost targets," Moorhead says. "Plastic is plastic and metal is metal, but if you can mold it in a differentiated way, the result may cost you a few dollars more [to manufacture] but can really set you apart." Currently available models show the variation tricks manufacturers have up their sleeves. Samsung's new ARM-processor-powered Chromebook is rated for 6.5 hours of life on a single charge, which is 2.5 hours more than the Acer C7 Chromebook's 4-hour battery. Perhaps not-so-coincidentally, Samsung's Chromebook outperforms Acer's at Amazon.com (when they're in stock) despite sporting a price tag $50 higher. HP hopes bigger is better with its new 14-inch Pavilion Chromebook. Meanwhile, the HP Pavilion Chromebook stands out because of its screen size. In a world full of Chromebooks with 11.6-inch displays, HP's sets the record with a 14-inch screen. "Larger is always better, particularly when it comes to low-cost stuff," Moorhead says. "A larger screen, all things equal, will sell pretty well. Of course, I say all things equal, but the HP Chromebook is also the most expensive Chromebook out there." It costs $330; Samsung's is $250, while Acer's is an impulse buy away at just $200. Lenovo's education-focused ThinkPad X131e Chromebook, on the other hand, loads up on ports and has a rugged design for backpack-friendly portability. Acer's C7 Chromebook boasts a big 320GB hard drive, eschewing the piddly amount of flash storage most Chromebooks ship with. Without a doubt, the possibilities for differentiation are certainly there. Scuttlebutt even suggests a touchscreen-enabled Chromebook may be in the works. That's an obvious way to stand out in the Chromebook crowd, but if the trends we see with Windows 8 notebooks are any indication, a touchscreen could whittle down battery life significantly. Can manufacturers find salvation in Chromebooks? More Chrome apps should function in offline mode. No. Or, perhaps more optimistically, not yet. The sales volume simply isn't there. As Moorhead notes, volume is everything on low-cost products, and until Google fixes some of Chrome OS's inherent limitations, consumers won't be clamoring for Chromebooks. That's huge; Apple may make a ton of money selling a comparative handful of laptops, but its laptops sell for $1,400 on average, not $250. The Chromebook mania we're seeing today isn't about the present, though. It's about the future—a future where PC manufacturers aren't beholden to Microsoft alone. These current models are scouts, hopeful harbingers of what may come; a tentative exploration of new lands, encouraged by the newfound acceptance of the cloud. That future is reliant on Google shoring up the cracks in its operating system, however, and then swaying consumers to hop onboard Chromebooks en masse to generate the level of demand necessary to justify a continued manufacturer supply. I'm convinced hardware makers can carve out successful niches in Chromebook design. It remains to be seen whether or not Google can convince people to buy them.